Dr. Camacho received her Doctor of Audiology degree from the University of South Florida (USF) in 2007. Since completing the Au.D. 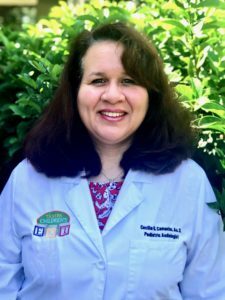 degree, Dr. Camacho has focused her attention mainly on working with pediatric populations. Dr. Camacho previously worked at All Children’s Specialty Care of Brandon and St. Joseph’s Children’s Hospital in Tampa. During these experiences, Dr. Camacho honed her skills in working with children, especially those with special needs. She volunteers with the Special Olympics and actively participates in the Healthy Hearing initiative within this organization by providing hearing screening services at local and state games as a Clinical Director. Prior to joining the Tampa Children’s ENT team, Dr. Camacho was an educational audiologist for Pasco County Schools, providing services to students at over 30 schools. This experience provided insight and knowledge to better assist families in navigating the educational system in obtaining plans and/or accommodations to address needs associated with hearing loss. She is a member of the American Speech-Language-Hearing Association (ASHA) and maintains her Certificate of Clinical Competence through this same organization. In addition, she is an member of the Educational Audiology Association (EAA) and the American Academy of Audiology (AAA). In her free time, she enjoys spending time with her fiance, John, and three children, as well has her extended family and friends in the Tampa Bay area.